David Head (Scrooge) has conducted a photographic examination of Big Four Glacier in from 2005-2009. Below is a map by Anderson and Vining in 1970. 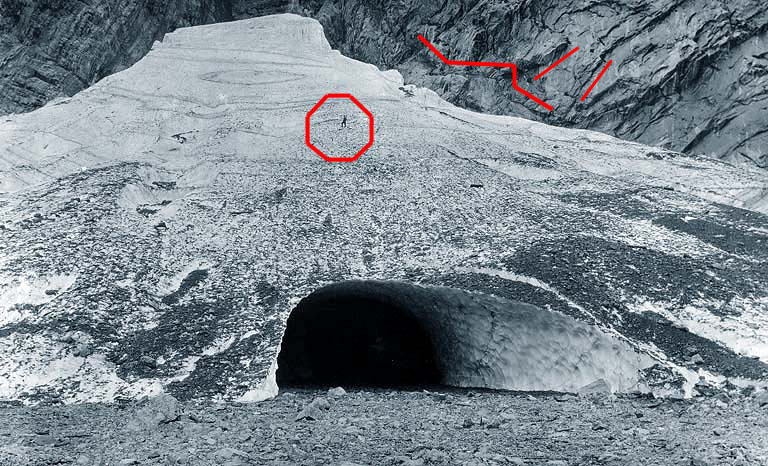 The question of whether this is a glacier is an interesting one. Look through this material and decide for yourself. This is an interesting case. All photographs besides the map and the 1920 image are from David Head. 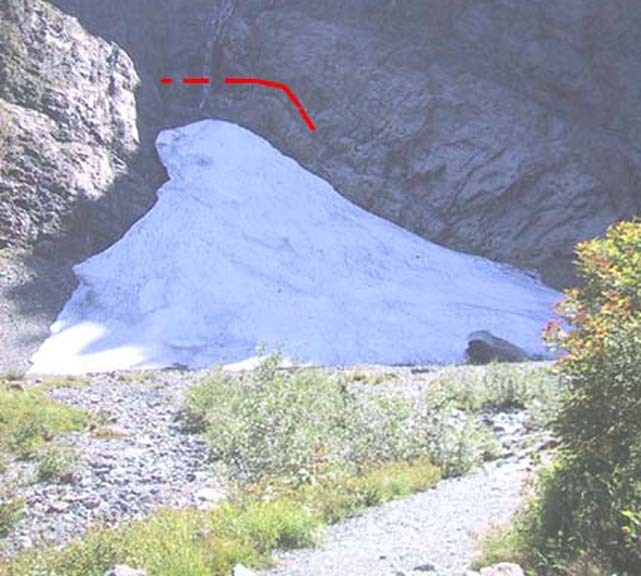 Certainly in 2005 there was very little snowpack left, and no evident glacier ice. 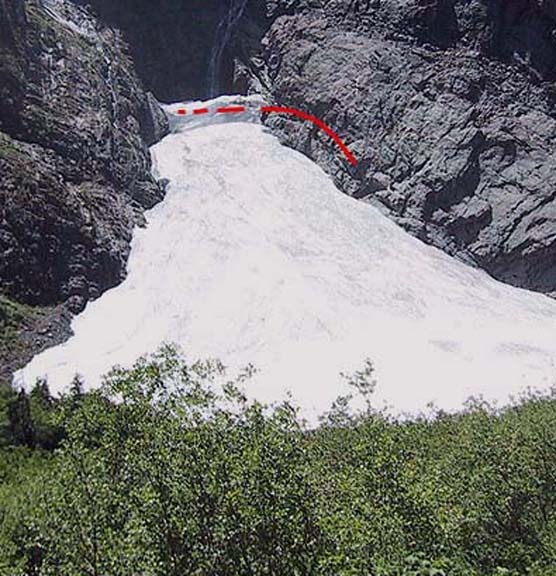 Each year from 2006-2008 the Big Four avalanche cone has added mass. Winter precipitation has been above normal in each of these three winters. There have also been some notable warm spells helping release snowpack above in large avalanches. 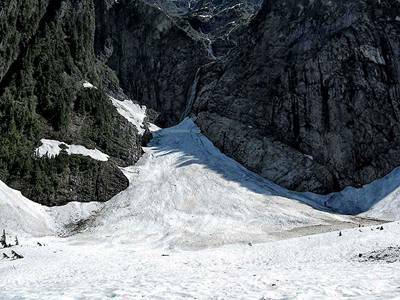 Given the size of the ice mass in 2008, it now appears to be a glacier. 2009 below proved to be another good year for winter precipitation and one rain on snow event in January triggered large avalanches in the area. It will be interesting to see if the large footprint of 2008 can be maintained. 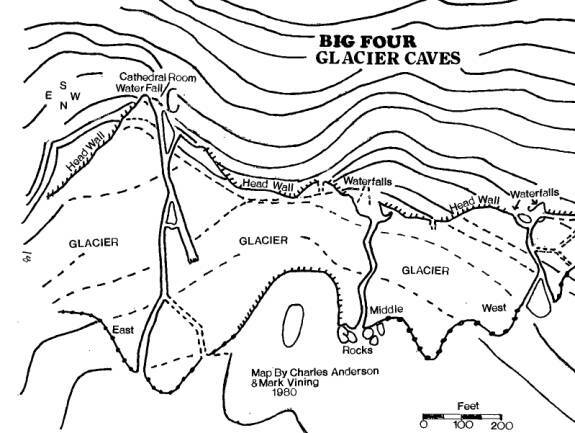 Big Four Glacier in 1920. This spot has long been a visited location. Traffic toward Monte Cristo has been high for a long time. 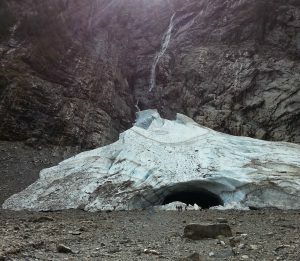 The amount of debris on the surface of the glacier suggests that this was summer of severe melting, exposing a number of years worth of debris. 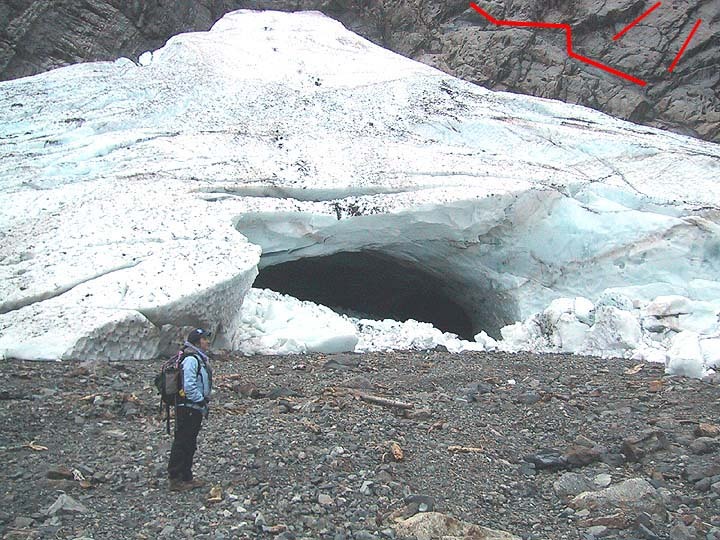 Below is a tunnel at the base of the glacier, indicating blue multi year ice below the surface layer. The new snow above is 2002, below likely 2000 snowpack. 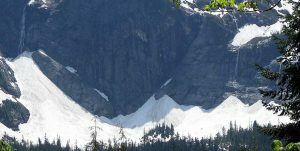 The 1999-2002 period featured heavy winter snowpack and avalanching boosting Big Four. The summer of 2003 was the first of three cruel seasons to Big Four. 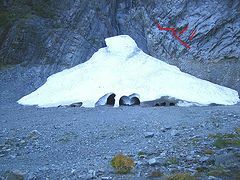 In this image you cannot note the blue case to all but the very top of the avalanche cone, indicating it is older snow. There is further two layers that look to be annual layers on the right side of the image. This suggests to me, the base is a 1999, layer, than a 2000 layer, than a broader dirty band and a 2002 layer, followed by a 2003 snowpack,. 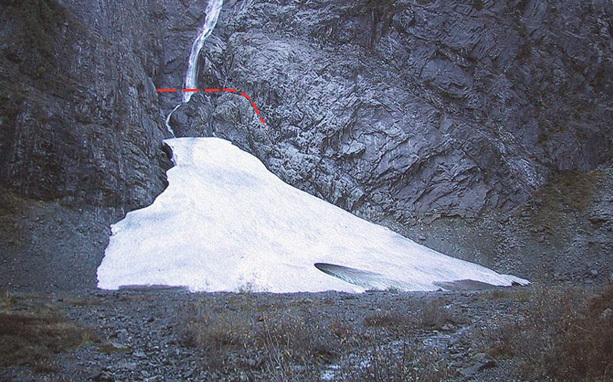 The summer of 2001 was warm and no snowpack would have survived, causing the wider dirt band. 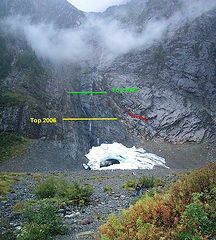 This sequence of pictures from 2007 indicates Big Four Glacier in July above, August above right, September below and October below right. All photographs from David Head. The October visit required rafting across the Stilliguamish River to reach the glacier. 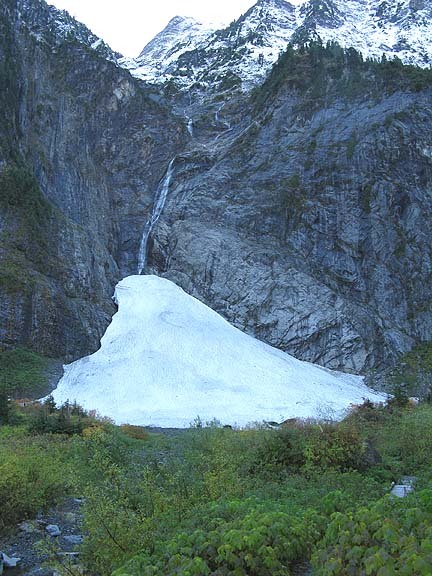 Above is Big Four Glacier in the fall of 2008. 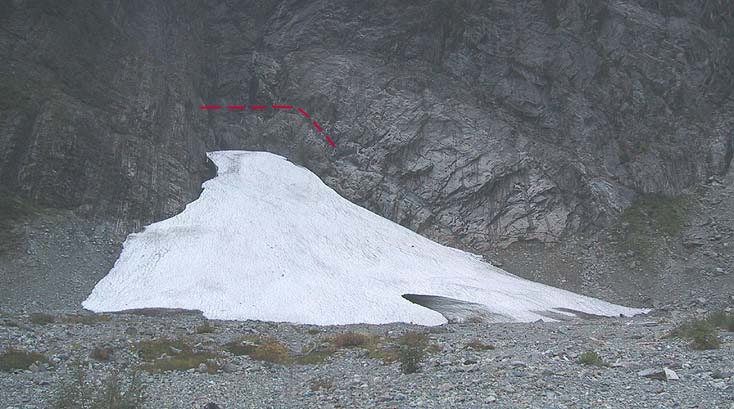 The top of the snow mass-glacier has now reached to about the greenline in the 2005 photograph. The change from September to October is modest. The interesting changes is the reappearance of the waterfall from above at the end of the dry season. Big Four in September 2015, nearly diminished to 2005 levels.